Synopsis: Paul Temple is called in to catch a killer who is murdering the patients of a doctor who specialises in nervous disorders. Former cop Paul Temple (John Bentley), now a successful author of crime mysteries, becomes involved in the hunt for mass murderer ‘Rex’ who’s going around killing pretty young girls and scribbling his name as a calling card for the hapless cops. 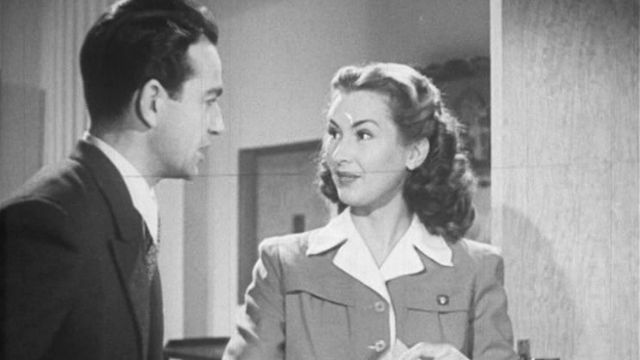 Aided by his perky young wife (Dinah Sheridan), Temple is soon on the trail of the killer. The world in which the characters in this film reside is so unrecognisable from the world of today that it’s difficult to believe many people would now be interested in watching it, apart from as some kind of anthropological research. Temple and his wife are stolidly upper-class; speaking with cut-glass accents, and employing a Filipino butler whose sole purpose in life is to serve his ‘masters’, they are unquestioningly certain of their position and status. So, too, is Spider Williams (Wally Patch – A Matter of Life and Death, Brighton Rock), the dodgy, working class character portrayed by the redoubtable Wally Patch. ‘Tea?’ offers Mrs Temple, ‘Ta,’ says Spider, handing her his saucer. Mrs T. dutifully pours some into the proffered saucer, followed by a drop of milk from a silver decanter. Later, Spider suffers a neatly shot death scene. The plot is fast-moving and convoluted, and is more enjoyable than expected. The clues fall into place for Temple and spouse with the obliging transparency of a trail of crumbs, but it’s still enjoyable. There’s a lot of characters, many of whom flit in and out, some of whom seem to disappear never to be seen again, and there seems to have been quite a lot of loose ends. Suffice it to say that the final reel features our heroes tied to a pillar in an underground chamber rapidly filling with water and all the suspects being gathered into one room for the grand unveiling, and you’ll know exactly what to expect.